Dr Jengo's World: Won a Ubisoft Competition! Woohoo! 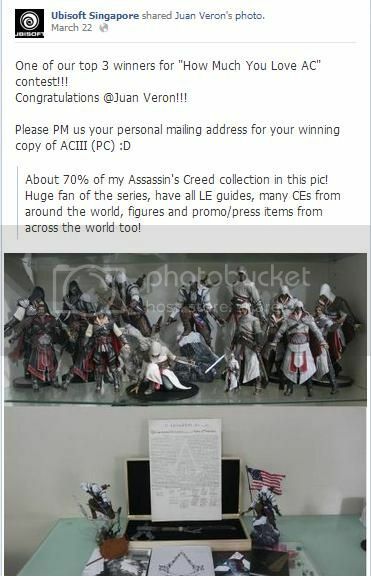 Won a "How much you love AC" contest from Ubisoft Singapore! Still I'm very happy. Prize is a PC copy of Assassin's Creed 3. Already own the PS3 version so will probably pass it to a friend. Was hoping I could go down to their studio in Singapore to collect it but couldn't allow it as they were working on some unannounced projects.. Couldn't risk a nosey blogger poking around their studio anyway.. haha. Some other day perhaps.. Thanks and sure I would love to be everybody's friend! Add me on Facebook?